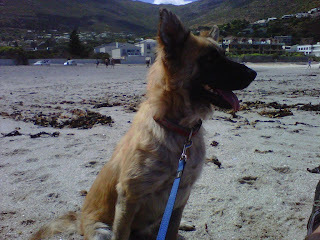 Max spent Saturday morning on Hout Bay beach. 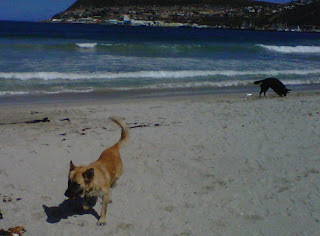 He had a good run around with his lady-friend (my friends black dog in the background), we even popped over to Dunes for a drink afterwards, not a bad life for an ex street dog. I have been walking him in Keurboom Park most days too. I keep him on the lead until we get to RBHS fields and then let him go. He walks with me until he sees another dog, then goes off for some intense bum sniffing and tail wagging. He sometimes comes back if I call him but most times I have to go and fetch him, which is a bit annoying, especially if he has gone a long way. I take treats on the walks so I can reward his good behaviour but he has no interest in them whatsoever and just spits them out (these are the same treats that he will practically do somersaults for at home). This makes incentivising his recall much more difficult. He is very friendly to other people and dogs, and much more tolerant of annoying aggro kak starters than I am. He is super chilled and I think other dogs see that as their opportunity to dominate and bully him, if they go too far I step in and sort them out. As you can see from the pictures his fur is getting better all the time. His general health is much better, he has more energy and is more playful. He also seems to be getting more confident and will bark when someone knocks on the door or pops their head over the back wall, which is natural I think. There has been some shrinkage of his empty nutsack so this looks a little less weird now. Next vet appointment is in two weeks, think that will be his last one for a while.